CMOS (Complementary Metal Oxide Semiconductor) Sensors are now not only hidden in numerous broadcast, film and action cameras (and often shouted about in leaflets you collected at NAB) - but also in your mobile phone, CCTV systems and webcams. 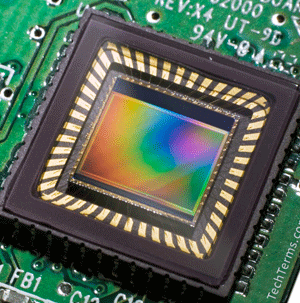 However, what exactly is a CMOS sensor, and how does it work? The University of Edinburgh claims a paper written by some of their researchers in 1986 was the birthplace of the single-chip CMOS based video camera. The premise of this design is not unlike other imaging sensors (like CCD) - to turn photons of light in to an electrical signal. Consider fig.1. Here, we can see that the photons (light) travel through a micro lens to help focus the beam down onto a single pixel's photo-diode. The photons travel past the internal wiring and digitisers of the sensor down to the photodiode itself, which turns the photon into an analogue electrical signal. Immediately after this, the analogue signal passes to a dedicated digitiser to turn the output into a series of binary values (1s and 0s). Finally, these binary numbers, along with the numbers from the other digitisers on the sensor, are sent on to another part of the camera for processing (referred to as the Imaging Pipeline). At this point, some readers may be wondering why the photons must first travel past the wiring of the chip before hitting the photodiodes. It is clear that this method means some light will not make it to the photo site, which will lead to a degraded image. Imaging companies such as OmniVision and Sony have addressed this by switching the wiring and photodiodes around (as per fig.2.). This style of sensor is referred to as "Back Illumined" and, naturally, provides better low light performance at the cost of being more complex to make and thus purchase. It is also worth noticing the colour filter in figures one and two. Most CMOS sensors use a colour filter pattern known as the 'Bayer Pattern' to generate the initial colours to be processed by the imagine pipeline. Fig.3. shows what the Bayer pattern looks like - effectively, it is a repeated 2x2 square featuring the colours Red, Green, Green and Blue. When Bryce Bayer patented the pattern in 1976, the rationale he offered behind the repeated green element was that green is the colour that the human eye is most sensitive to. As such, to ensure that cameras capture images closer to 'human vision', this filter is now used in virtually all CMOS sensors. Some of the photodiodes, however (usually around the extremities of the sensor) have a black filter. This allows the system to measure 'dark current' - or how much of a false signal (often shown as noise in an image) is generated when there are no photons hitting the sensor at all. By using this technique, it then becomes possible to calculate where noise could exist in the illuminated photodiode readings and remove it, leading to an improved image quality. Mike Colyer is a Special Cameras and Vision Engineer who is currently studying towards a PhD in the field, investigating how small camera systems can be improved and made safer. He was awarded the RTS 'Young Technologist of the Year' award in 2015, a year after graduating Ravensbourne University with First Class Honours in Outside Broadcast Technology. He has worked with the cameras on shows ranging from "Formula One", across to reality shows such as "I'm A Celebrity Get Me Out Of Here" and strongly believes that special cameras pave the way to more immersive content.